It was my friend’s birthday almost half a month ago (yes I know how late this post is…) and he’s a huge fan of Baileys® and brownies, so I decided to bake something that have all of these components in one recipe. I didn’t have any recipe on hand that involve Baileys® and brownies, only Baileys® and cake. So I did a little Google-ing and ended up with numerous recipes to choose from. After much sifting, I’ve decided to opt for a combination of both recipes, one by Peabody and one by Zink. But I cannot believe my absent-mindedness. Talking about absent-mindedness, in Singapore we always call people who are very absent-minded “blur sotong”. It is something like an absent-minded squid. And how that came about… I have no idea. It’s all the hybrid of dialects, tradition and culture that this term came about. Anyway, the point is that – I have a very short-term memory. It will actually take me a while sometimes to remember what I have had eaten for dinner the previous night. Haha. I’m extremely amazed by one of my professors in class. He took only 10 minutes to remember all of our names (and faces) and he can recall each and every one of us during his class. Each class has the size of around 20, and he teaches around 5 to 6 classes each semster… so that’s around 100 over students to remember! I can never imagine myself doing this. So, coming back to the course of baking these brownies, I, of course, did made a mistake (if not, why would I be talking about it..? =p). After making the cream cheese swirl, I set aside the bowls, the beaters and the spoons used to make the swirl. Then I realized there’s a small white ceramic bowl next to my bowl that contains the cream cheese swirl. And inside the white bowl… there’s sugar. Sugar in it. I had forgotten to add in the sugar when I am supposed to “gradually add in sugar into the creamed mixture”! Therefore, while making the brownies batter, I added in the 1/4 cup of sugar that’s meant for the cream cheese into the brownies batter. 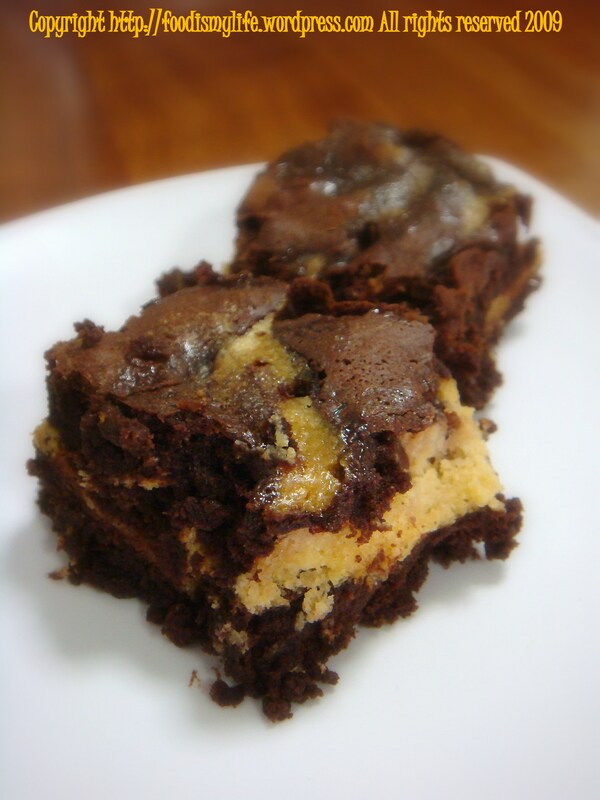 Thankfully these brownies did not come out weird. It’s still very tasty and yummy. However I would probably double the swirl the next time I make them again. The swirl, to me, is too little and was easily over-powered by the chocolate. I love the drizzling of the Baileys® into the brownies. It makes the brownies even more flavourful. I added only 2 tablespoons that time, I’ll increase it into 3 tablespoons the next time. 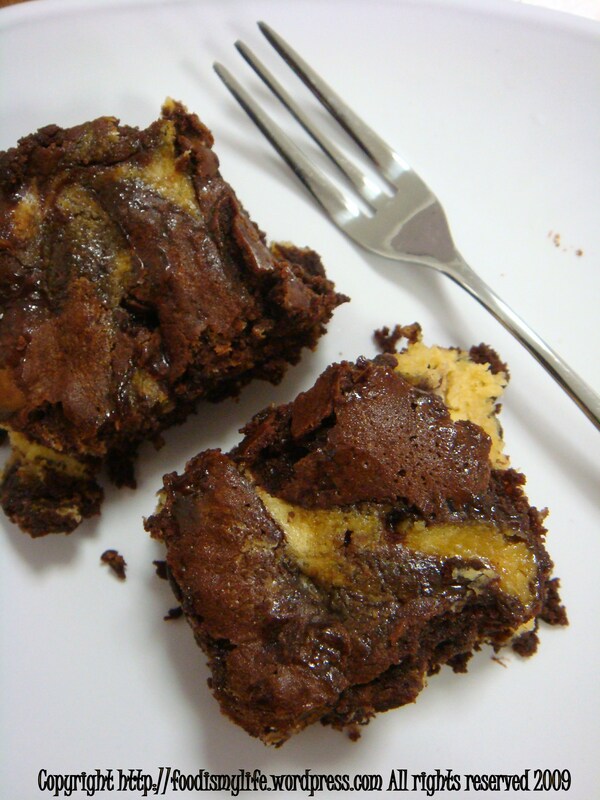 So if you are a fan of Baileys®, chocolate, cream cheese and brownies – this is the recipe for you! Preheat oven to 175°C. Lightly butter an 8-inch square baking pan. Line a baking sheet in the baking pan, extending the sides for easy lifting. Using an electric mixer, beat cream cheese and butter in medium bowl until light and fluffy. Gradually add in the sugar and beat until well blended. Beat in the egg and vanilla. Fold in flour, Baileys®, and vanilla. Set mixture aside. Lightly toast the pecans for 10 minutes. Let cool and chop them into bite-size pieces. Set aside. Combine the baking chocolate and butter in a heat-proof bowl. Set over a pan of simmering hot water (double boiler) and melt the chocolate and butter until the mixture is smooth and free of lumps. Cool slightly. Using an electric mixer, beat sugar and eggs in a large bowl until slightly thickened, about 2 minutes. Beat in the chocolate mixture, vanilla and 1 tablespoon of Baileys®. Fold in the flour, baking powder and salt. Spread half of chocolate batter in the prepared pan. Using a rubber spatula, spread cream cheese mixture over chocolate batter. Spoon remaining chocolate batter over top of cream cheese mixture. Using the tip of a knife, gently swirl through batter, forming a marble design. Bake until tester inserted into center comes out with a few moist crumbs attached, about 30 minutes. Using a skewer, randomly poke holes in the brownies and drizzle the remaining 2 to 3 tablespoons of Baileys® into the brownies, depending on how strong you want the Baileys® taste to be. Let the brownies cool in tin before lifting it out. Cut into squares and serve with whipped cream or a scoop of vanilla/Baileys® ice cream. Or even better – serve with a small slurp of Baileys®! looks nice and chocolately! hahaha how was your HK trip? 🙂 we havent had the chance to catch up in ages!